It notes - beside much other material - a triumphal event for cardinal Vitelleschi in 1436 and another event for Corrado III Trinci in Foligno at 14th of May 1438 (after he had conquered Spoleto). Interestingly both honored persons ended murdered in prisons, Vitelleschi in April 1440 (prisoned short before) and Corrado Trinci at 14th of June 1441(prisoned in 1439) ... so somehow in the time, which is of special interest to us. Both died in the context of the reign of pope Eugen. If I get this right, then Vitelleschi captured Trinci, was then prisoned and killed himself some time later, and then also Trinci was killed. It's a good book, worth buying. But if triumphal parades had any influence on the choice of subjects and sequence of the Tarot triumphs, then we can't just list every time somebody had a victory parade. We are looking for events where allegories were depicted or performed as part of the parade (rappresentazioni, tableaux vivants, lebende bilder, etc. ).This narrows down the choices quite a bit. The wagons or platforms upon which the allegories were presented could be called "trionfi", as in 1457 when Galeazzo Maria Sforza described how he was welcomed to Ferrara with several (three I believe). The Saint John the Baptist parades in Florence had elaborate allegories, much beyond the merely religious subjects appropriate to the Baptist. I'm not sure if they were called "trionfi", though, in any surviving source. The earliest victory parade-triumph which included these allegories seems to be Alfonso's in 1443. The guild of Florentine merchants sponsored a large section of the event. Ross G. R. Caldwell wrote: It's a good book, worth buying. Well, I'm just happy to have found something so early, which somehow connects to the Trionfi ideas (we cannot expect, that the Trionfi celebrations in the 1430s already had stylish elements, which they had in the 1450s; and generally I think, that there was not so much). It should be expected, that these customs developed in small steps in creative dialectic, in which one Trionfi festivity inspired the next to imitate and to change and to improve the celebration forms. 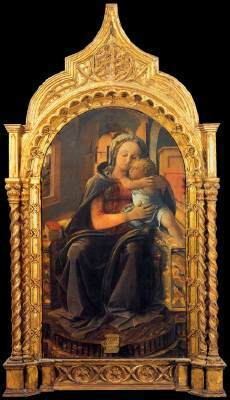 Biondo Biondi in c. 1457 found it of value to discuss, which the right antique Trionfi forms were. As with the Trionfi cards we've there a growing public interest. Too big to show it here. 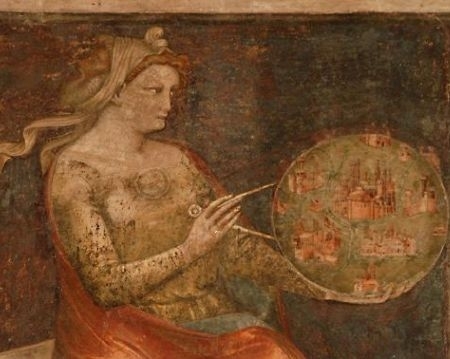 It's an astronomy of the 7 artes, and it is given as painted in 1411-12, so rather early. 7 planets. Ages of Man. Hours of the day ... so the whole is made with some sense for medieval systems. Also many other frescoes. All frescoes in the palace, except those of the chapel, were commissioned by Ugolino III Trinci, who died in 1415. Their execution started probably in 1407. The concept of these fresco cycles probably came from Francesco Federico Frezzi, the bishop of Foligno and author of the Quadriregio, a poem of the four kingdoms Love, Satan, the Vices, and the Virtues. 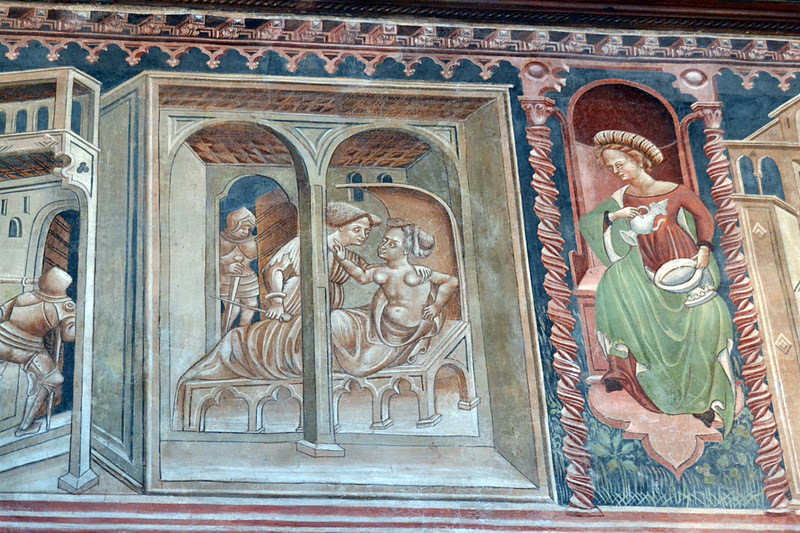 Some of these frescoes were painted between 1411 and 1412 by Gentile da Fabriano, with the assistance of Jacopo Bellini. The designs were by Gentile da Fabriano, but their painting was almost completely done by pupils. 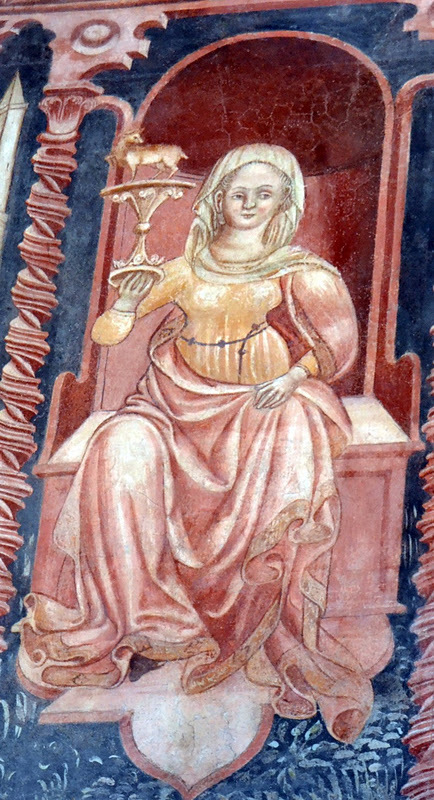 The authorship of the frescoes was attested by Lodovico Coltellini, a scholar who saw in 1780 two receipts to Ugolino Trinci by Gentile da Fabriano for painting the halls. I "detected" the Palazzo, when following Corado III Trinci, the man, who celebrated a Trionfi in "1436" [likely wrong date] as described above in the first post. I checked also art, which possibly was influenced by cardinal Giovanni Vitelleschi, Trinci's opponent. Vitelleschi started to build a Palazzo, but it was finished in 1460, long after his death in 1440. Part of it seems to have been a personal "studiolo", which is given to the time of before 1440 (I actually thought, that Leonello d'Este started the studiolo fashion). The image reminds me again on something with Leonello, the Muses for his studiolo. "Angelo was a native of Siena and, before he came to Ferrara, he worked in Umbria. In the year 1439 he was the subject of an active correspondence between the community of Sienna and Cardinal Vitelleschi. The painter was then in the prison of the town of Nocera on account of a murder committed in Camerino, and the townsmen of Sienna intervened on his behalf with Vitelleschi. Angelo "illud homicidium non-fecit corruptus pecunia … sed … rixe juvenum" (the painter was then very young). But the Cardinal refused their petition; "Si deliquerit igitur punietur." Happily, he appears to have relaxed his severity later on for, after November 7 1447 we find the artist in Ferrara, the favourite of Lionello, and afterwards of Borso." The relation between Macagnino and Vitelleschi stays not clear to me. Anyway, whatever the relation, Macagnino survived Vitelleschi, and I've a curious suspicion about the studiolo of Leonello. In the time of 1452-55, when the Trionfi cards found an high interest in Florence and Ferrara, we have, that Borso had a big favor for this Angelo Perrasio. Ferrara loved to present their Muses sitting on a throne ... after Angelo Perrasio was active there (he died 1456). Already Vitelleschi seems to have had a preference for "women on throne". Vitelleschi in July 1439 (so at the end or still during the active council) started to gather some less important condottieri for an attack on Foligno and Trinci (actually already in 1438 had been an attempt by him). By a treason of the population Corrado Trinci was captured in September. The Trinci ruled in Foligno and some other towns since 1304 with some interception in the 1370s. Braccio da Montone fought against the Trinci in the service of king Ladislaus (so before 1414). Ugolino died in 1415. 3 Ugolino sons ruled then in Folino. Two of them were killed in a treacherous manner 1421 by a castelan. The youngest brother Corrado could reestablish himself with the help of Braccio da Montone (1423). Muzio Attendola (Francesco Sforza's father) and Braccio da Montone died 1424. After the successful revenge of his father's death Francesco Sforza seems to have cooperated with Trinci in an attack on other Bracceschi near Perugia. Somehow Sforza forced Corrado to make peace with Pope Martin (all in 1424). Sforza decided then to work for Filippo Maria Visconti, which developed to his longer Milanese period tiil 1433 (when he went to the Marches). There, close to Foligno, Trinci belonged to those, who opposed Sforza, but he gave way in 1435. In 1438 (really difficult to find) I found something, which relates to the "triumphal action" in Foligno cause a win in Spoleto ( which was what I was searching for a long time). Chiede rinforzi a Francesco Piccinino, al Trinci ed alle autorità di Norcia, di Bevagna e di Montefalco affinché tutti insieme assalgano Spoleto. Prende la via dei monti, supera le guarnigioni che sorvegliano i passi ed irrompe nottetempo nella città, che viene messa orrendamente a sacco, non risparmiando né case né chiese. Sono 1000 gli spoletini cui è richiesto un riscatto e 14000 le some di bottino portate a Foligno. Il Furlano si ricongiunge ancora con Francesco Piccinino e muove contro Assisi; si accampa a Santa Maria degli Angeli dove, dopo due giorni, è raggiunto da due commissari viscontei che sollecitano il suo rientro in Lombardia. Prende la strada per Pianello e si ferma ad assediare Pergola. ... both relating to Durante Dorio as source. The story and date "1438" is confirmed by the reports to Francesco Picconino, also at condottieridiventura.it. ... delivers some details of the action against Trinci in 1439 (in the biography of a foe), when he was captured. I just visited the Trinci Palazzo/Foligno in April and took several pictures of the planets (fantastic overall museum by the way - a good day trip from Assisi), however no need for me to upload here as you can view all of them (what's left of them - some of the frescos are very fragmentary) along with a detailed discussion of the history of the palace in Anne Dunlop's Painted Palaces:The Rise of Secular Art in Early Renaissance Italy (Yale, 2009). Perhaps of even greater interest in this same book are the frescoes of the seven Virtues and seven Vices (a'la Giotto, with a few variations and the fact that they are in color - not grisaille) in the Palazzo Minerbi-del Sale in Ferrara (see Dunlop, 91f). The cycle has been dated to the early 1360s and was for a family closely aligned with the d'Este - who knows whom was quartered there during the Council of Ferrrara but the cycle must have been well-known in Ferrara (the more famous Schiafonaia frescoes coming well afterwards of course) and certainly is grist for my Virtues/ur-Tarot theory (relevant for when the Council was moved to Florence). It's interesting to see, that the court of Trinci employed various of the medieval iconographic groups, but the picture program of the 7 virtues is missing. Maybe it had existed once. Wiki states: "The concept of these fresco cycles probably came from Francesco Federico Frezzi, the bishop of Foligno and author of the Quadriregio, a poem of the four kingdoms Love, Satan, the Vices, and the Virtues." I don't see anything of "Vices and Virtues". Maybe it was a plan, that never became fulfilled. The picture program, as we know it, seems to be interested to show forceful knights and rulers, somehow it present "knight interests". The Trinci surely belonged more to the knights than to a group, which was interested in "virtues". This reminds me on the situation of the PMB, painted by two different painters and so parted in two groups. The first group contained 14 cards and only one could be compared to a virtue, a "Justice" with an unusual knight (which possibly meant something else as just Justice). The six other cards had two clear virtues Temperance and Fortitudo, a third not clear card, which possibly was understood as Prudentia, and the triad Sun-Moon-Star, which seem to be a replacement for Caritas-Spes-Hope. If the base of PBM (70 cards, 14 special cards) was generated in 1452 ... Sforza was then still much more knight than ruler. So we would have then a similar feature as we observe in the (surviving) Trinci pictures. An observation on the Quadriregio text, which has 4 books : Love with 18 chapters, Satan with 19, Vices with 15 and Virtues with 22. Maybe the poetical solution, that Satan wins against Love with 19:18 (= 1:0), but virtues win against vices with 22:15 (= 7:0). So perhaps the association of the choice of Hercules between Love and Virtues, with the promise, that the decision for virtue would finally give the better result. Well, I looked for Trinci to collect better information in "matters of triumphal customs before 1440" under the question, if there are events which could have had an individual "strong influence" on that, what initiated the phenomenon "Trionfi cards". The individual event "Trinci triumph" looks as a minor occurrence, which couldn't have moved very much. It appears inside the actions, with which Filippo Maria Visconti tried to disturb the council at Ferrara, which had opened its activities in April 1438. Trinci had a momentary success, thanks to the presence of Francesco Piccinino. Si impossessa di Assisi (vi rimane come suo luogotenente il pisano Benedetto degli Agapiti); tocca Panicarola e Ponte San Giovanni dove i perugini gli fanno avere 100 fiorini ed i doni rituali. Acquista nella città 12 some di lance, picconi e pali di ferro necessari per le sue truppe. Si dirige a Foligno ed accetta la riconciliazione offertagli da Corrado Trinci, che termina con la promessa di matrimonio tra la figlia di costui, Marsabilia, ed il fratello Leone. Combatte Norcia e ne ottiene la resa ai primi di luglio dietro il riconoscimento di un’indennità di 16000 fiorini da pagarsi in tre anni ed il pagamento di un censo annuo di 700 fiorini. Si manifesta nemico degli aragonesi: il duca di Milano, pubblicamente, lo diffida ad intraprendere azioni offensive nei confronti di un suo alleato. Ritorna in Toscana ed accoglie a Portopisano il re di Provenza Renato d’Angiò, liberato da una lunga prigionia in Borgogna e pronto per la sua spedizione nel regno di Napoli. Lo Sforza è riconfermato nei suoi beni ed ottiene la dignità di Gran Connestabile; tocca Capo d’Acqua, conquista Amatrice ed impone ai terrazzani una taglia di 1500 ducati, conquista il castello di San Flaviano (Giulianova) a spese di Giosia Acquaviva. Sforza's close brother Leone arranges a marriage with Marsabilia, daughter of Corrado Trinci. At another place I saw, that Leone married her already in 1436 (again this 1436-1438 exchange, so it seems, that there is some confusion in the records). Around the same time there's a treaty, that Sforza should fight for Renee d'Anjou. At the same place (Sforza time table) we find, that Sforza had a triumphal activity in January 1434 in Fermo. Si accorda con i Chiavelli di Fabriano; gli si ribella Ascoli Piceno che, dopo un tenace assedio, sottomette ad un brutale saccheggio da parte delle sue milizie. Fa il suo ingresso trionfale in Fermo; visita la fortezza del Girifalco ed ordina alcuni restauri e miglioramenti difensiivi. Giovanni Vitelleschi fugge a Roma portando con sé il tesoro del santuario di Loreto. Contrariamente alle aspettative del duca di Milano Francesco Sforza si dichiara signore della Marca. In contrast to the Trinci event, this should have been a matter with greater effects (although I've difficulties to find any reports), cause it really changed the world for some longer time. The Vitelleschi and Trinci events seem to be smaller imitations of the Sforza successes. This looks like "World", but likely it means something different. Nice image finds on the net Huck. That is indeed the Fool, just a flipped version of Giotto's Scrovegni Fool and colored (vs. grisaille). Great image. It is certainly Prudentia, not only because she has the compass as Phaeded noted, but because she has two faces. It is more like Prudence-Ratio - the Measure of Things. I still don't buy a Prudence in the Charles VI Tarot.